Mark your calendars for this online event tomorrow! The Google+ Hangout will take place tomorrow, April 23, at 12 noon Eastern / 9 a.m. Pacific. 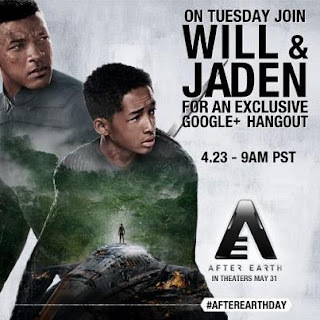 Moviegoers can tune in to the live Google+ Hangout at YouTube.com/AfterEarth, as well as Google.com/+AfterEarth where fans are invited to submit their questions for a chance to have them answered by the panelists. Visit the Facebook page too!